When the pharaoh died a great amount of effort was placed into the funeral. In fact, many pharaohs spent a great deal of their life trying to prepare for this occasion. For example, Khufu, a pharaoh from the Old Kingdom, spent nearly 20 years constructing the pyramid to protect his mummified body. So much effort went into these funerary occasions to ensure the prosperity of the pharaoh’s afterlife. If the body of the pharaoh became damaged or unrecognizable by its Ka, the energy that creates life, the pharaoh would lose his chance of an eternal existence. For this reason alone so much effort was placed into ensuring the body was protected and the burial was nothing less than grand–especially for those who were wealthy or privileged. Most elaborate burials were done for the pharaohs. They hand the finances to ensure the event was impressive and dramatic. Others who were less fortunate were not able to produce such lavish ceremonies. Instead, most middle class and poor citizens of Egypt had standard funerary customs. Most of their financial efforts were placed into the mummification process. The funeral began by leaving the embalming home to the gravesite. This journey was carried out by loved ones, priests, and paid mourners. Several oxen and one high ranking priest would lead the way. Attached to the oxen, a bier carried the mummified body, followed by carts which carried the belongings of the pharaoh. A high ranking priest would lead the way while reciting prayers or chanting hymns. 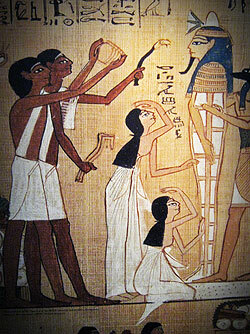 The arrival to the tomb entrance was often crowded with servants who stocked the pharaoh’s belongings inside the tomb. These belongings included furniture, jewelry, and statues. Objects that were essential where also placed inside the tomb to rest such as the canopic jars, clay bottles that contained the pharaoh’s organs, and funerary figurines. These figurines were used as magical substitute servants should the pharaoh need any labor in the afterlife. The Opening of the Mouth Ceremony is the act of restoring the mummy’s senses. This act was done at the entrance of the tomb by the eldest son, known as a lay priest, to allow the mummy to accept sacrificial offerings. If there were no heirs to perform the rite, a sem priest would perform the act. 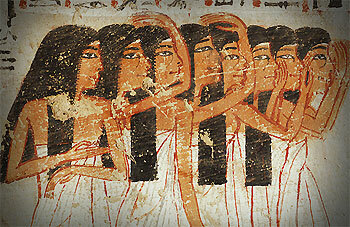 This was famously noted in the wall painting of Tutankhamun’s tomb. Because the young pharaoh did not have an heir to his throne, his vizier Aye performed the rite ensuring his claim as the next ruler. Prayers and spells were also performed by lector priests from funerary texts to help the mummy transition to the afterlife with ease. These rituals could last for days and as many as 75 rites were performed. A high ranking mummy, such as a pharaoh, had the ceremony performed on all pictures and statues that resembled him. These rites helped to ensure the mummy, and any statues in the image of him, could become transporters of his Ka should his body become damaged. The tools used to perform the Opening of the Mouth Ceremony were pretty standard for all rituals. These tools consisted of the pesheshkaf (indented blade), an adze (flat pick shaped tool), a serpent headed blade, and various amulets. Along with these tools, the right leg of an ox would have been butchered for the occasion. After the rites had been given to the mummy, a lector priest recited chants outside the tomb. At this time the final offerings were placed inside the tomb and it was swept out. Outside the tomb mourners ate oxen and bread while the priests made their way back across the Nile. Once all the celebrations were completed the tomb was then sealed. Cemetery workers applied stone, rubble, and a plaster door stamped with a royal seal. Although the tomb was sealed shut, it was important that the Egyptian family add offerings to the tomb for as long as they could finance it. This was done in hopes that the loved one would not go through a second death in the afterlife.